While listening to this at work, there were points where I had to pause and choke back the tears that were starting to form. I’d like to say thank you to every person who has made such sacrifices in their life to give us the freedoms we seem to take for granted all to often. Well written by a true American hero. Much respect for Marcus, as a well as every other man and woman that serves. THANK YOU! It's a powerful story that's often hard to hear in more ways than one. I've often felt that ROE's cost more lives than they save. It's a double edge sword, but I'd rather it cost some unfortunate "collateral" damage than cause any soldier to fear prison and die because of such fear. If the damn politicians want to start wars, maybe they should go fight them. If they're not willing to do that then they really need to shut the hell up and let our men and women do what they need to do. The movie has nothing on this book!!! Amazing!!! Kept me on the edge of my seat. Very well written and narrated. The fact that a person can survive to "tell the tale" is remarkable in itself. Much respect to our military who put their lives on the line to protect ours. Wow!! They are incredible men so proud of them. I had my moments it was very hard for me to continue to read but I did and I cried. Thank you gentlemen. I enjoyed the narrator very much. An inspiring book highlighting the harsh reality of war as well as the consequences of the American media caring more about headlines than about hard choices soldiers must make. Great book from a great man. The narrator wasn't my favorite but the story is truly patriotic and hard lived. this book has touched my soul and I will never forget any part of this book. Wow... Incredible account of many brave men and women that protect and serve our country. 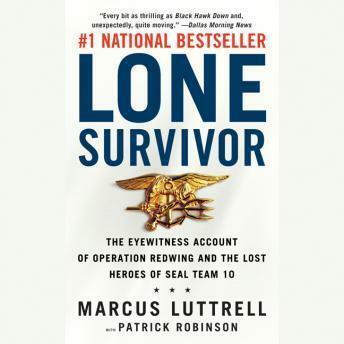 Many significant details of Marcus 's journey made this impossible to put down. Great book! Sorry, but I couldn't even finish it. The story was good, but the underlying glorification of war and those who make a career of it was too much. Very preachy. Very amazing book.Very inspirational and I would recommend for older ages. My middle schooler loved it. Narrator did amazing and made me felt like I was in the book. Totally recommend!!! !